Jamaica's FM Warren Elliott makes an impact !! 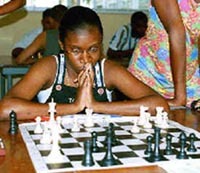 There is something wonderful going on in Jamaican chess. After winning his FM title in the subzonal 2.3.5 last October, Warren Elliott has taken a leadership role in promoting chess the way a national champion should. The Montego Bay native organized his first chess festival on the weekend of January 26-27th at Norman Manley Law School. This festive occasion featured youth tournaments and the awarding of plaques and prizes in four categories. All winners received three months of training from FM Elliott as well as chess scholarships, software, books, trophies and medals. How about that!! Dr. Hope Anderson (former national women's champion), Dr. Harold Chan (Jamaican champion--1972-74), NM Neil Fairclough (Jamaican champion--1985 and 1991; Caribbean champion--1985 and 1991), NM Shane Matthews (Jamaican champion--1984, 1986-87, 1989, 1997) NM Robert Wheeler (Jamaican champion--1979-81, 1983, 1988), and former Jamaican Chess President, Frederick Cameron. FM Grantel Gibbs is the current President. This is an absolute breakthrough in Jamaican chess as FM Elliott has decided to take the responsibility to pass on the talent he has garnered in such short order. These types of efforts will loom large in Jamaica's effort to produce their first Grandmaster in the near future. It is players like FM Elliott and NM Matthews that will be able to lead the charge and blaze the trail for so many of the determined players not only in Jamaica, but throughout the Caribbean. Congratulations Jamaica… nuff respect every time!! Check the Jamaican Ambassadors Chess Academy for further details and photos. The site has been nominated for "2001 Best Chess Site."